Windows Phone 8.1 comes with a lot of prospects in the geo location end and usually the next thing after detecting your very own location, people tends to look for one another thing and that is tracking the location as it should update itself. So, if you’re wondering about how you should instantiate a map and track your location, you really should check out my previous post . Go over your project properties and go over Capabilities. 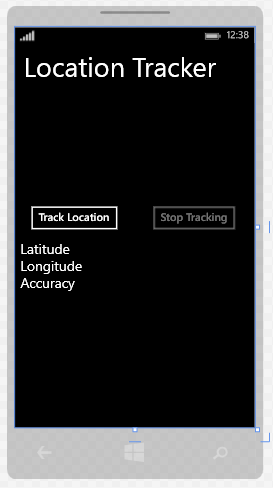 Enable Location for your app (If you are from Windows Phone 8, you’d be pretty amazed that you don’t see ID_CAP_MAP anymore. <Button Grid.Column="0" Content="Track Location" Click="TrackLocationButton_Click"
<Button IsEnabled="False" Grid.Column="1" Content="Stop Tracking" Click="StoptrackingButton_Click"
Now, let’s move towards the MainPage.xaml.cs part. As the previous article suggests, the first thing you need is definitely a Geolocator . So please go ahead and define a Geolocator instance. The reason we are using that would be pretty clear if we look at what are we doing. We are constantly updating our LatitudeText, LongitudeText, AccuracyText and as we are accessing a UI thread frequently from a event handler, we do need to make it sure it doesn’t block the regular UI interactions. Thus we used a CoreDispatcher here, much like it was in Windows Phone 8 as Dispatcher. You’d also be able to notice that the event handler is async and thus dispatcher.RunAsync invocation was awaited. We used CoreDispatcherPriority.Normal and you can even try a higher priority if you like. All this event handler is doing is it is actually updating the UI and the textblocks. Now all you need is a StoptrackingButton to get things to stop and all you have to do is unhook the locator_PositionChanged event handler. As this sample has geolocator usage, this is always better to be tested in a device but you can definitely try it on an emulator too. To test it load the app on the emulator first by invoking build. Now after you pointed a primary location in the map. Now you can try clicking the track location button. After you do that Latitude, Longitude and Accuracy would pop up for the place you clicked on the map. Now click some more around it. And you will see the data changes on the textblocks. You can do one thing more too. You can change the interaction mode from Live to Pin and play all the pins. That would even allow to emulate place changes in your emulator. The following gif would definitely help you. And the code sample is here. I’m new to windows phone 8.1 runtime app development and need help, your blog has helped me develop faster. Please i need help to display the continuous tracking location polyline and Icon on the map.